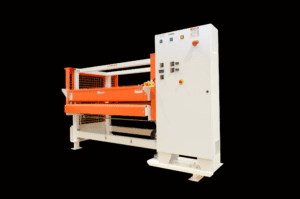 Our roll presses are ideal for large or small projects, using rollers rather than platens, to give you the utmost in quality for a continual lamination process. These machines are designed to create a lasting seal by bonding high-pressure plastics, papers, vinyls, veneers, metal skins, continuous films and fabrics, heat reactive and pressure sensitive films to substrates such as particleboard, plywood, rigid or flexible foam, woven or non-woven fabrics, honeycomb and any other porous or non-porous materials you may use in your manufacturing process. This bonding process is completed through applying high pressure at varying rates of speed to ensure there are no bubbles, blisters or wrinkles on the product surface. Our rotary laminating presses can easily meld paper onto cabinet and furniture sheet goods, or bond HPL to particleboard and MDF, to create a sleek finish, providing an incredibly efficient and smooth feed-through roll process. Our roll laminators are available in 5 standard model configurations that feature hot or cold rollers and can be modified with features to suit your specific application. We offer a variety of configurations to manage your varying pressure and production requirements, and to provide for all of your roll lamination needs. Check out our standard models below. Contact Us Today to learn how you can customize your Black Bros. roll press to turn your rotary laminating line into the best it can be. to particle board and/or MD F, the Panel Express offers an economical approach to “Fast Tack” laminating. Utilizing high-solids PVA through a Black Bros. Roll Coater/Adhesive Spreader, a “Fast Tack” laminating line can yield component or full sheet parts ready to machine, shortly after leaving the press. Due to the high-efficiency heaters in the Panel Express, PVA laminating can be expedited to allow for a true “One-Piece-Flow” system that is sure to maximize your efficiency and minimize your cost. The most economical industrial roller press in the Black Bros. line of laminating presses, the RL-750, is a cold roll laminator with a high output capacity. 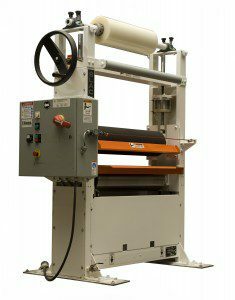 The RL-750 features a durable cold pinch roll system that is able to produce an incredibly efficient cold laminating process. Should you require a cold process for “Fast Tack” laminating, PUR laminating, Epoxy laminating or PSA laminating, the RL-750 can handle it with ease. This rotary press provides amazing accuracy, offering the ability to easily change thickness through a large hand wheel that is outfitted with a digital indicator. Plus, the RL’s air cylinders can deliver up to 2,000 pounds of downward force, giving you a smooth finish every time. The RPP Series is our most customizable series, offering multiple options to ideally suit whatever application you are taking on. Designed to operate either “Hot or Cold”, the RPP Series features a pressure variance from 4,500 to 18,000 pounds of force, depending on your model and configuration, giving you a wide range to choose from. 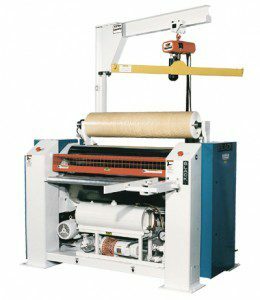 The application abilities of this series of machines range from film to foam, film to film, film to sheet, and sheet to sheet with many other options in between. The possibilities are almost endless. One unique configuration of these machines can produce high volume engineered wood flooring, while another can seal a foil face to EPS foam. Black Bros. can also provide several add-ons to this series, including unwind/rewind units, edge guide controls, edge slitting, end-to-end cutting, monitored pneumatic or electric braking, and easy-to-change air shafts for holding rolls of laminate/overlay/films, helping you create the exact machine you were searching for. The TB-60 has earned the reputation as the top compact laminator on the market, and has helped make Black Bros. the industry leader in the continuous laminating of decorative surface products. This industrial solution makes it the perfect choice for bonding papers, vinyls, and other film laminates to particle board, plywood, and MDF substrates. A TB-60 can be run with either pre-applied or in-line applied adhesives. Also, the footprint of the TB-60 consumes very little space, even as the workload of this laminator produces to industrial standards. 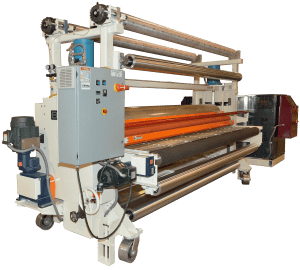 Due to the thick-walled, large diameter rollers, hydraulic pressure cylinders, and integral oil heater, the TB-60 makes any laminating job an easy task no matter the size of your shop. Allow Black Bros. to engineer a customized system for your TB-60 to suit your unique application requirements. The TB-60 Hot Roll Laminator is a cost efficient paper and foil laminating process, whether you run 24 hours a month, or 24 hours a day! Black Bros. has the solution to your laminating needs! Contact us today!